While DL may have begun in New York, that's not the only place celebrating tomorrow night. 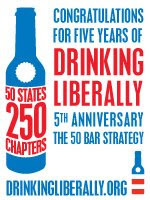 Here's a partial list of chapters hosting 5th Anniversary parties around the country. Want to know if your local chapter is hosting one? Contact them directly or sign up for your local list. 7:30pm onward - 1st drink on us. Partying on the upstairs patio starting at 7:00.
to celebrate Drinking Liberally's Fifth Anniversary. (plastic or aluminum please since we're poolside). Also, if you want to bring an appetizer that's great. so feel free to bring your swimsuits if you're so inclined. Bring your music and instruments if you like. Children are welcome! contact lawrence (at) drinkingliberally (dot) com for details! Thursday, May 29th, 2008 from 7-9 P.M.
7pm at Old Chicago in Brandon. 3015 S University Dr. at 6:30 pm.